The "Magnolia Table" cookbook offers a taste of what life is like in the Gaines household. No, it doesn't taste like shiplap. Joanna Gaines' recipe for chocolate chip cookies uses less butter than most. If you’ve ever wondered what makes chocolate chip cookies chewy, crisp, soft, flat, thick, cakey or moist, the answer usually involves butter. It all depends whether you use butter vs. shortening, how much butter you use, and whether you melt it, cream it or brown it. Rarely would anyone consider that using less butter would result in a superior cookie, but Joanna Gaines has somehow drawn a blueprint that works. 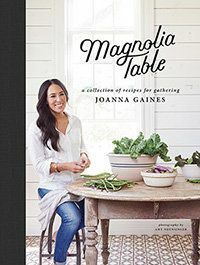 Gaines, the co-star of HGTV’s popular “Fixer Upper” show based in Waco, Texas, has released a cookbook called Magnolia Table: A Collection of Recipes for Gathering. In it, she shares a recipe for chocolate chip cookies that’ll make you do a double-take when you read the description. Gaines’ recipe calls for one stick of butter, whereas traditional recipes call for at least twice that. Martha Stewart uses two sticks, and David Leite and Jacques Torres both call for 2 1/2 sticks. But Gaines’ recipe somehow produces a chewy treat (not crumbly or cakey, two major cookie sins, in my book) with a classic chocolate chip cookie flavor. Below is the recipe and an excerpt from Magnolia Table. Reprinted with permission from Magnolia Table, by Joanna Gaines. Copyright 2018 by Joanna Gaines. Reprinted by permission of William Morrow, an imprint of HarperCollins Publishers.